A fascinating aspect of having African grey parrots in the household is the ubiquitous background noise they provide. Unlike macaws or even cockatoos they always seem to be vocalizing. Anyone with an African grey parrot probably doesn't realize how much they enjoy the constant noise until they lose it. 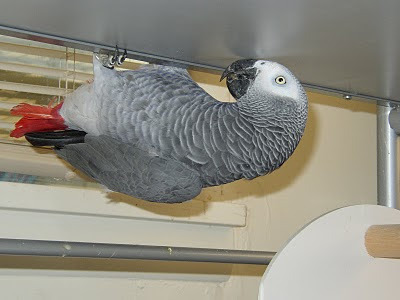 When our first Congo African grey parrot Corky died from heart failure in March of 2006 we faced the sudden quiet in the household, even with four macaws and a Goffin's cockatoo. We knew we wanted another Congo African grey. 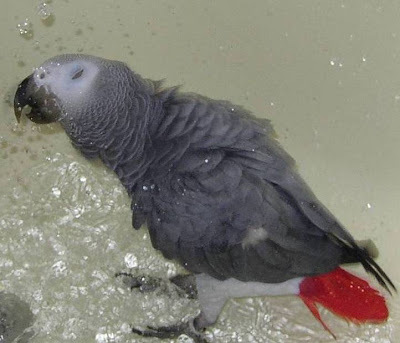 Within a month we came across an unusual Craigslist posting for a female Congo African grey parrot which had lost its owner and needed to find a good new home quickly. The parrot was hiding in an apartment complex hoping the management wouldn't find out. We went to visit the parrot in its hideout, and it was love at first sight! The parrot came home with us. 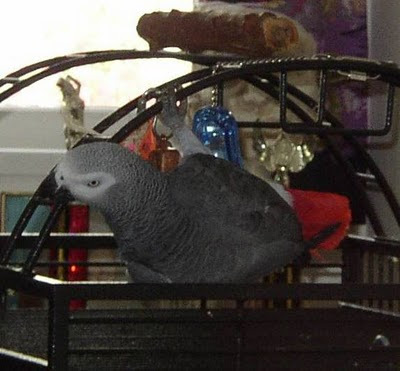 Our Congo African grey parrot Arua, her first day home with us, April 2, 2006. Arua is a confirmed female Congo African grey parrot (Psittacus erithacus). Arua is a very large grey. The average weight for an adult Congo African grey is 400 grams. On her first visit to our avian veterinarian, Arua weighed in at about 480 grams. On first seeing her, our vet called Arua a fatty! When we acquired Arua, she was believed to be about ten years old. Her owner was a Polish fellow living in Spokane, who passed away on New Year's Eve of 2005. Apparently he was not found for three days. We believe his name may have been Oliver, because that is a name Arua frequently repeated when she came to us (she never says the name any more). A Polish lady in Everett, Washington, brought the bird back from Spokane, and that is how she came to us, via Craigslist. In her first year or so with us Arua said many words we did not understand but which we believe were Polish. It's been awhile since she's repeated any foreign words. The only reason we know Arua is her name is because she constantly and consistently calls herself by that name. Just hanging out. Arua is one acrobatic parrot! Arua is our one parrot that not only knows her name, but knows the name of every member of the flock in this household, parrot or human. She says: Hi Hope. It took her awhile to get Michael correct. For the longest time it was Ickle! She knows Rox or Roxanne, Bubba, Boo (Aboo), Tara, and Tillie. The only parrot whose name she refuses to say is that of our Goffin's cockatoo Kid Kadra. She does not like Kid, who harasses her given the chance, and she ignore's him. Arua tolerating a bath. Arua does not like showers, but prefers to bathe in her water dish. Arua is one of the friendliest Congo African grey parrots we've encountered. Although she has a slight disposition for females over males, she will readily step up with just about anyone. Since she joined our flock she has developed her flying skills. Our first Congo African grey parrot Corky flew like a lead brick, but not Arua. Arua's flight feathers were clipped when she first came to us, but we let her flight feathers grow out, and her flying skills have improved from her first noticeably labored attempts to now being a competent flier. No doubt she has been encouraged to improve her flying skills because of the aerial harassment she gets from our Goffin's cockatoo, Kid Kadra. Initially if Arua wanted to get anywhere in the house she'd climb off her cage and trudge across the floor. She still hikes around, but now she's just as inclined to fly to her desired destination as walk. In addition to her usual African grey vocalizations, Arua has a well defined speaking voice. We no longer hear any Polish words, but she continually speaks and continues to pick up English words and phrases. Interestingly, she tends to pick up words and phrases from the male of the house, but virtually nothing from the female of the house. I taught her to say Michael correctly, and I'm trying to teach her to say Don't break the door! That was a phrase our first Congo African grey Corky favored. Just like Corky, Arua will slam her cage door closed, at which time we say Don't break the door! A couple of Arua's favorite phrases are: Whacka Whacka, and Whoop De Doo! When she wants something to eat, she'll say: Who wants a cracker? If she wants more food, she'll say: You want more? She'll let us know if the food is Hot! Arua is a hard taskmaster. If she thinks a meal is taking too long to prepare, she'll scold: Are you done yet? She's always warning us to: Watch your tail! Or Watch your toe! Since our Timneh African grey parrot Tillie joined our flock, she's constantly admonishing us to Watch our Tillie! She likes Tillie. Alot.Sometimes she threatens us by exclaiming: I'll get your tail! When we make coffee, she offers the helpful suggestion: Add more water. Of course, she farts and burbs, occasionally comes down with a bad cough, and has a sneeze so fierce it's a wonder she doesn't fall off her perch. She's often wrestling with her toys, hanging upside down and whacking her bells. We warn her to be careful or she'll fall down and go boom. Sometimes she does. Invariably, she'll pick herself up, climb back up, and go right back to it.